Arizona residents all want their homes to be as energy efficient as possible. In addition to being better for the environment, it also costs less to keep a home at the level of comfort we all want and deserve in a house. Perhaps you know your home isn’t very efficient, but you aren’t even sure where to start. What changes need to be made if you don’t have a huge budget? How do you prioritize the improvements that will help the most first? The frustration can lead to inaction among many homeowners. At AZ Energy Efficient Home, we offer professional assessment to dissect a home’s unique profile. This will allow us to analyze what the problem points are that may be forcing homeowners to choose between comfort and costs. We’ll go through your house with a fine-toothed comb, evaluating common problem areas in a home in order to identify issues. Leaky ductwork or poorly sealed connections waste a ton of energy, making a home work harder to keep comfort in all rooms. Testing and identifying issues with the flow of air can improve air quality and the overall comfort of each room. This especially can be a problem in older homes or those that have been extensively modified since the original build was finished. A house may need additional supply or return vents installed to effectively improve airflow, efficiency and comfort. 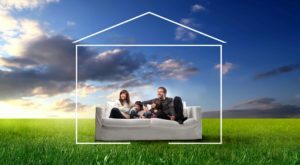 We find that 90% of homes out there have under-performing insulation which leads to higher utility costs, excessive wear on HVAC units and most importantly comfort. Most insulation companies do not have building science knowledge to install insulation effectively so to maximize value hire a Home Performance contractor. An HVAC system that is constantly running or hot spots is felt throughout the house are indicators there may be a need for an energy assessment. An A/C unit that won’t cool or heat as efficiently as it should often leaves homeowners afraid to see their next utility bill! Our professional staff will come to your home to help you understand how each aspect is impacting your home’s energy performance. We will address each individual issue that could help you stay comfortable for less. The energy assessment will identify needed repairs that may be needed to improve a home’s efficiency. Local utility companies often offer rebate incentives on many of the commonly identified repairs. AZ Energy Efficient Home is an APS and SRP Preferred Contractor who will help execute the rebate process and help you save money on your monthly utility bills. Don’t settle on sweating it out this summer! Contact us to start creating a comfortable energy efficient home.